She played an acclaimed role in Elizabeth in 1998 and appeared in Lord of the Rings as Galadriel. 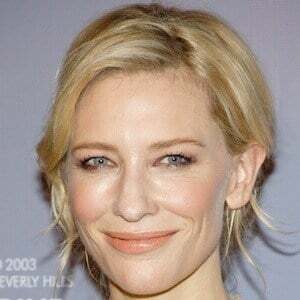 In 2014, she won the Oscar Award for Best Actress for her performance in Blue Jasmine. In 2017, she appeared as the character Hela in the blockbuster film Thor: Ragnarok. She studied Economics and Fine Arts at the University of Melbourne. She played Katherine Hepburn in the film, The Aviator, and was one of multiple actors to portray an aspect of Bob Dylan's persona in the 2007 art film I'm Not There. Her portrayal of Sheba Hart in the 2006 film Notes on a Scandal earned her a Florida Film Critics Circle Award for Best Supporting Actress. She married Andrew Upton in 1997, and the couple had three sons. In 2015, she adopted a daughter named Edith. She appeared with Orlando Bloom in Lord of the Rings.